The Cookie Dough Lover’s Cookbook GIVEAWAY! Every Thursday at the shop, I make ginormous batches of all our cookie doughs. And I totally eat ginormous amounts of cookie dough, too! I’d like to say that I do it in the name of quality control, but really it’s a lack of self control. Cookies-in-the-raw just may be better than baked ones. I clearly have no problem snacking on raw eggs (although now that I put it that way…), but if you so deprive yourself, then you’ll be happy to see The Cookie Dough Lover’s Cookbook by Lindsay Landis, who also writes the gorgeous food blog Love and Olive Oil. She has ingeniously concocted an eggless cookie dough that isn’t meant to be baked, but used raw, as an ingredient or an out-of-the-bowl snack. Now I normally take my dough straight up, but I’m amazed by the diversity of recipes in this book…candy made from cookie dough, cakes, pies, puddings, breakfast stuff (what?!). And, of course, there is ice cream…ice cream that is calling–no, screaming–my name. All of this is gorgeously photographed…proof that these things are real and not just in my dreams! The very kind folks from Quirk Books gave me a copy of this cookbook, and now I want to give one of you a copy, too. Maybe we can make Chocolate Chip Cookie Dough Ice Cream together next weekend?? What do you say? Just leave me a comment (one per person, please) on this post before 5:00 pm EST on Thursday, June 7 and I’ll randomly choose a winner from the list. Be sure your e-mail address is correct so I can contact you! Oh, this is a dangerous, dangerous little game! Mmmmm. Cookie dough. Sometimes it’s even better than the cookies it ends up making. Cookie dough is a wonderful thing to have in your house. It doesn’t last too long in my house. Raw cookie dough is my Kryptonite. Count me in for raw cookie dough! Looove raw cookie dough (way more than the baked version, actually)! A cookie dough cookbook! Where have you been all my life? Cookie dough is amazing and I don’t eat nearly enough of it. I must admit I love raw cookie dough too!! Looks like a great cookbook. Wonderful! Throw my name in the hat, too. Your job sounds like so much fun! I love raw cookie dough and half baked cookies. This book looks like fun- and I can never satiate my hunger for new cookbooks! Keeping my fingers crossed for the contest! I love cookie dough more than baked cookies too! 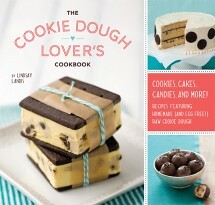 A book dedicated to cookie dough might be dangerous for me but I’m willing to risk it! Haha, I’m so with you. I’d so much rather eat the bowl of cookie dough than actually bake the cookies! I’m so intrigued by the recipes in this book, it’s such a fun idea! Oh… this can be dangerous. This just gives me an excuse to eat more cookie dough! I’m loving all the posts on this book! Looks so fun. And yummy. love cookie dough! i also read the author’s blog. I have been eyeing this cookbook every time I visited Love and Olive Oil over the past few weeks. Thanks for the chance to win! I would loveeee to win this cookbook! Cookie dough ice cream sounds perfect for my upcoming girls’ night! I would to be entered in the drawing..love any cookie dough!!!!!!!!! I have the same horrible habit of eating raw cookie dough. I would love to win this book and start trying the recipes. This book looks so good! Yum!